56 days. [1939, Clemson/SC. AAS winner.] 4-7 ft. plants with few side-branches. Ribbed pods (1¼ x 8 in. 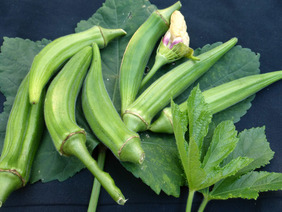 ), harvest when pods are 3 in. or smaller. Spineless characteristic makes this popular variety easy to pick. Pkt.